2 Should You Choose a Kraus Faucet For Your Kitchen? Kraus is one of the world-leading faucet manufacturers. Their faucets are designed to look great, but they are also very durable and highly functional. But did you know that all Kraus kitchen faucets come with a limited lifetime warranty? Read the following article to find out more about their products. In our Kraus faucet reviews, we will reveal the pros and cons of each product without withholding the truth. One of the advantages of choosing Kraus is that their products usually cost just a fraction of what the equivalent products developed by the competition would cost, and they will perform similarly. Kraus is nowadays one of the leading faucet manufacturers, and their products just keep getting better. To find out more about the faucets developed by Kraus, read the article below. Now that you know some of the advantages of choosing Kraus faucets for your kitchen, let’s take a quick look at some of their products. If you’re looking for a faucet that won’t ever go out of style, you have to take a closer look at the Kraus KPF-1640SS. This model has a double-spring heavy-duty design that will not only be fashionable for years to come, but it will also be very helpful in the kitchen. This faucet has a single-lever design that will help you adjust the water’s temperature with ease, and the swivel rotates a full 360-degrees for a better functionality. The pull-down spray head has a magnetic docking feature that makes it very easy to use. The faucet will look great in every kitchen, and the pull-down design will help you clean larger pots and dishes with ease. No Deckplate – This model is suitable for a 1-hole or a 3-hole installation, but it doesn’t come with a deck plate. You will have to buy it separately. Conclusion: The Kraus KPF-1640SS is a stylish faucet that will look great in every kitchen. 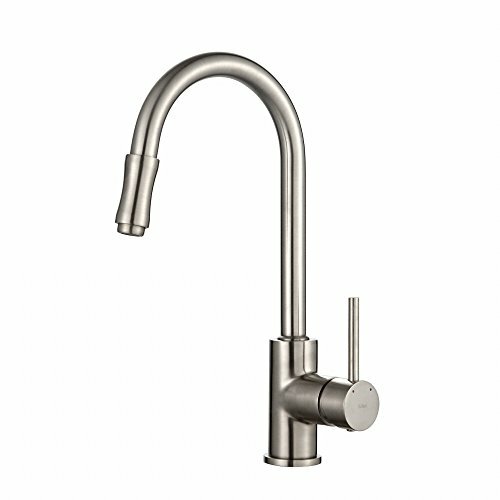 We also recommend our guide to top commercial kitchen faucets. Whether you’re looking for a replacement for your old faulty kitchen faucet or you’re for one to install in your brand new kitchen, you have to take a closer look at the KPF-1630SS faucet model developed by Kraus. This faucet has a pull-down design that will help with cleaning the dishes. The sprayer has two functions. You can use the spray function to remove stubborn stains and the aerated stream for your everyday chores. Switching between the spray patterns is done easily, with just a push of a button. The Kraus KPF-1630SS is a highly functional faucet that will help you with your kitchen chores. 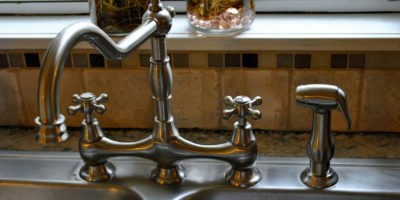 Quality Issues – Some customers complained that the faucet starts to leak after a year or so of use. If this happens, contact the customer support, as the faucet comes with a lifetime warranty. Conclusion: The Kraus KPF-1630SS is a good-looking faucet that’s also very functional. Some customers complained that the faucet might leak over time, but the lifetime warranty covers this problem. The KPF-1602 is a great looking faucet. Whether you’re looking for a model to upgrade your old unit, or you’re looking for one to install in your new home, you will make a good decision buying this one. This faucet is built out of brass for increased durability, and the stainless steel and chromed finish are highly resistant to scratches and rust, so you will be able to use the faucet for years on end without any problems. The faucet comes with a pre-rinse spray that will help you clean the dishes. All the materials used in this faucet’s construction are top quality. The ceramic cartridge should last for at least 500,000 cycles, and the Neoperl aerator reduces the water consumption without lowering the pressure. Pre-Rinse Spray – This model uses a powerful pre-rinse spray. When you activate the sprayer’s lever the water will be diverted to the sprayer, helping you get rid of difficult stains. Great Design – The faucet’s open coil design makes it perfect for modern kitchens. This model would look great when installed on an island counter. Water Pressure Has To Be High – If you’re planning on buying this model, make sure your home has a high water pressure. If it doesn’t, the sprayer won’t be very powerful. Conclusion: The KPF-1602 is a great-looking faucet. It has an ultra modern open coil design that makes it great for modern kitchens. Unfortunately, the sprayer needs a high water pressure to work as it should. 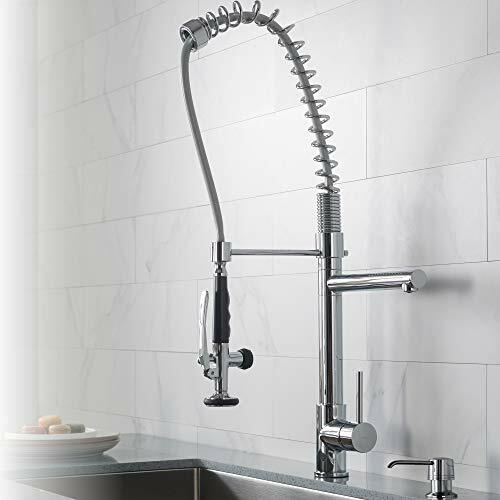 If you’re looking for a modern faucet that will look great in your kitchen and will also be of great use when you’re cleaning the dishes, you have to look at the Kraus KPF-2250. This faucet has a modern pull-out design that will come in handy when you have to clean large dishes, pans, and pots. The pull-out sprayer uses two spray patterns to help you with your chores. The stream pattern is good for everyday use, while the spray pattern is very good at removing tough stains. The faucet has a swiveling range of 120-degrees, so you can even mount it on double basin sinks and still use it easily. Easy Installation – This faucet is very easy to install. Most people will be able to install it themselves without any problems. 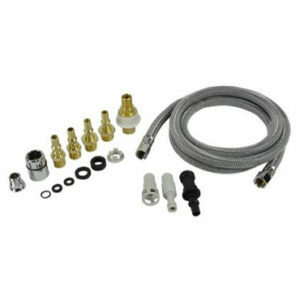 Plastic Sprayer – The faucet comes with a plastic sprayer. This might affect the product’s durability in the long run. Conclusion: The Kraus KPF-2250 is a nice-looking kitchen faucet that’s easy to install. The unit’s sprayer is made out of plastic for safety reasons, but it can affect the unit’s durability. 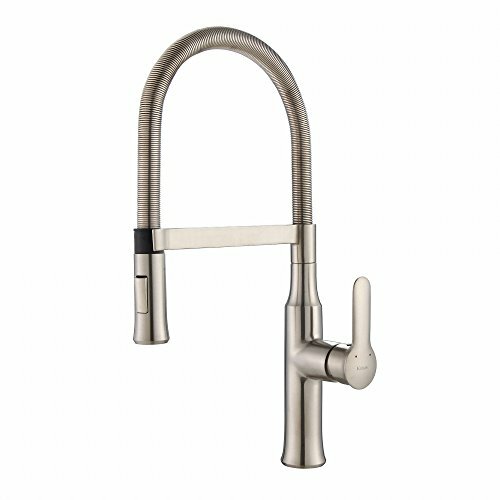 The KPF-1622SN is a good-looking faucet that will make a great addition to both traditional and modern kitchens. The faucet has a minimal design with sleek and accurate lines, and it will fit great in every kitchen. This faucet has a high-arch pull-down design. The pull-down sprayer is ergonomic and it secures safely into the spout. The sprayer has a counterweight that makes it easy to manipulate. The faucet’s single-lever design will make adjusting the water’s temperature easy, and you will be able to make small adjustments quickly when you have to. The Neoperl aerator will reduce the water waste, but it won’t lower the water pressure. Ceramic Cartridge – This faucet uses a ceramic cartridge that has been tested for 500,000 cycles. This increases the faucet’s durability, and you will be able to enjoy it for a long time without experiencing leaks. 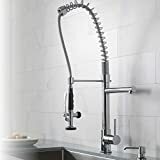 High-Arc Design – The faucet’s high-arc design will allow you to clean large dishes with ease, even if you choose not to use the pull-down sprayer. 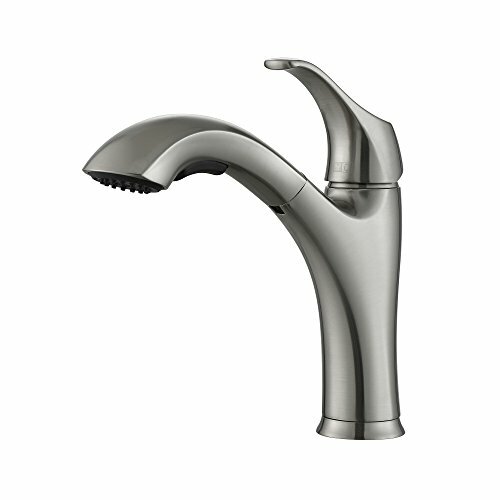 Single Spray Pattern – Unlike other faucet models, this one has a single spray pattern. Conclusion: The KPF-1622SN is a great-looking faucet that has a minimal design. The faucet will make a great addition to most kitchens. Should You Choose a Kraus Faucet For Your Kitchen? Now, you might be curious why you should choose Kraus products over the ones produced by other manufacturers. 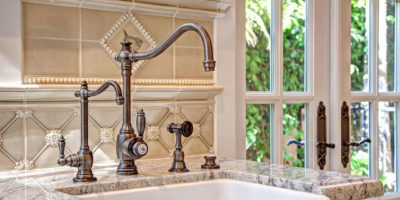 Well, in the following section we take a closer look at the Kraus kitchen faucets, and we reveal their true strengths. Kraus has a broad range of kitchen faucets, so it’s difficult to narrow down all their characteristics. It’s safe to say that you can find a Kraus faucet to fit every style and fashion you might want and that all their faucets use the latest technologies to be more durable and efficient. 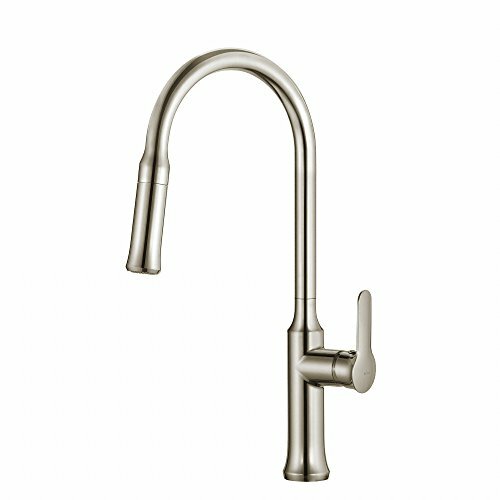 Here is a list of the most frequent characteristics you can find in a Kraus kitchen faucet. – Whether it’s bronze or another alloy, most Kraus faucets are made out of metal. This is a great feature, as it makes the faucets more durable so you can enjoy them for a long time. – Kraus uses ceramic cartridges for their faucets. These cartridges have been tested for up to 500,000 cycles, so you can rest assured you’ll be able to use them for a very long time without experiencing any leaks or drips. – Whether it’s chrome, stainless steel, or something else, Kraus finishes are top notch. They don’t get stained easily, and most importantly, they don’t scratch easily. These finishes are made to last, so they will endure the usual wear and tear over the years and still look brand new. – Even though you might find some exceptions, most Kraus kitchen faucets use a single handle. This allows you to change the water’s temperature with ease, and it will be of great assistance in the kitchen when you clean the dishes. 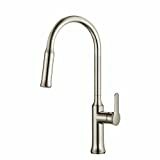 – All the kitchen faucets produced by Kraus have a spout that can swivel. Most of the spouts can swivel a full 360-degrees, but some of them can have a limited swivel. 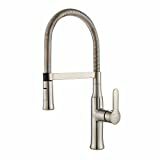 – Every kitchen faucet you choose will respect all the codes and standards applicable in all states, so you can be sure you’re allowed to install them. – Kraus kitchen faucets are easy to install, and most people will be able to install them themselves, without any professional help. If you’re not experienced with faucets installations, you can just follow the manufacturer’s instructions. – All the kitchen faucets produced by Kraus need a minimal maintenance. You only have to wipe them down when they’re dirty and that’s about it. You shouldn’t use any cleaning products on the faucets because they might harm the finish. You can find all the spare parts you need on the manufacturer’s website ( http://www.kraususa.com/parts-support.html ) If you’re not sure what part you need, contact the customer support service. Their specialists should be able to help you identify the problem and order the right spare parts. You might find the necessary spare parts at your local authorized retailer. All Kraus kitchen faucets come with a limited lifetime warranty. If you notice the faucet has any performance problems, contact the customer support service for more information. The limited lifetime warranty covers all defects due to craftsmanship or material error, and the manufacturer will send you the spare parts free of charge. If the product seems defective, the manufacturer can choose to send you a new unit instead. Kraus has an excellent customer support service. Their professionals are familiar with the products, and they can guide you through the installation and defect determination. You should contact the customer service whenever you encounter any problems with Kraus products. Kraus implements the latest technologies into their products to develop modern fixtures. All their faucets use high-quality ceramic cartridges, and more. Here is a list of technologies specially implemented to help you in the kitchen. 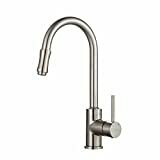 – Kraus has a lot of models that use a pull-down faucet. Most of these have two spray patterns, but some have only one. A pull-down faucet will be of great help in the kitchen. – There are a lot of pull-out faucets developed by Kraus. These faucets are smaller than the ones with a pull-down design, but they are also very helpful. – The Neoperl aerator will reduce the water waste without lowering the faucet’s water pressure. – Kraus faucets come with rubber nozzles. These nozzles prevent build-ups, and they are easy to clean. Kraus is based in Port Washington, New York. The company is one of the largest faucet manufacturers in the world, and their bathroom and kitchen products are known to redefine interior spaces. Their products combine craftsmanship with quality and aesthetic variety, and they most often than not change the way a kitchen looks entirely. When you buy a Kraus faucet for your kitchen, you’re actually buying a centerpiece. 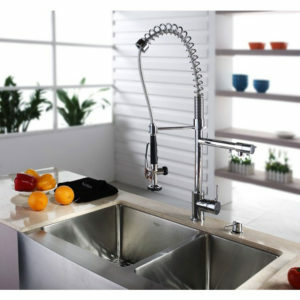 Their kitchen faucets not only look good, but they are very functional and durable as well. All kitchen faucets developed by Kraus come with a limited lifetime warranty, so make sure you hold on to the receipt when you buy one. If there’s a problem with the product, all you need to do is to call the manufacturer’s customer service and tell them about it. With the help of the receipt, you will benefit from spare parts, or you might even get a new problem, depending on the problem. Kraus is a good and dependable brand. Even though some people might not have heard about them until recently, they will be pleasantly surprised. Kraus products are designed to look great and to last long, and they usually come at a lower price than the equivalent products developed by the competition. We’re certain that after reading our Kraus faucet reviews, you can now understand what makes them one of the largest faucet manufacturers in the world. Kraus implements the latest technologies into their products, and they usually offer them at a lower price than their competition. Kraus kitchen faucets come in different shapes and sizes. Some of them have a pull-down design, some a pull-out one, and some of them have traditional designs. No matter which type of kitchen faucet you prefer, buying a model developed by Kraus means you get a high-quality product. No matter their design, Kraus faucets will quickly become the centerpiece of your kitchen once you install them. If you’re looking for a faucet brand capable of producing high-quality units and sell them at a decent price, you’ve found it.